"It's Not The Size Of The Lion, It's The Size Of His Heart"
Hi my name is Barry Beard..................I am 26 years old. I will be 27 in September. I was born and raised in Harrisburg, Pa. I have Cystinosis. This is my story. I was diagnosed with Cystinosis at 11 months of age. I was diagnosed in Harrisburg in 1976 by Dr. Brent J. O'Connell (a family peditritian). In that same year I started seeing Dr. Roth at Philadelphia Children's Hospital. I saw him for a year, then in 1977 I started to see Dr. Marc Yudcoff also at Philly Children's Hospital (CHOP). The first 5 years that I saw Dr.Yudcoff my parents and I would drive 100 miles to the Hospital once a month. The next 8 or so years I went to CHOP every 3 months. Dr. Yudcoff is a really great doctor. He is just one of the reasons that I am still here today. He knows his stuff. I started to take cystayanime, an experimental drug (that was supposed to help your body get rid of the extra cystine cyrstals in your body) around age 3 (1978). This med. was really nasty. It tasted like roten eggs. My parents said that I would spit it out and that we would all sit in the living room and cry. My parents found that mixing it with Coke distilled some of the taste, but it still was very bad. My breath would smell and kids would make fun of that. This was expremely hard when I got into my teenage years. I took this medication plus many others including Neutral Fous K. I took cystayamine until about age 20 (1995). I then began taking the med. for cystinosis that I currently taking (cystagon). This was even worse tasting and smelling when you mixed it together. I could not swallow pils until about age 21. I then began to swallow the pills. This helped a lot with the smell. But if you take 5 or more of these pills, your breath will still stink. I saw Dr. Yudcoff until about age 15 (around 1990). In that year I decided to start taking Growth Hormone, with the recommendation of Dr. Yudcoff. You see I was very small, about 4' 7". Dr.Yudcoff recommended that I start seeing Dr. Wassner, at The Milton S. Hershey Medical Center because he was the doctor that was giving the Growth Hormore to patients. He was also one of the best Doctor's in kidney disease. So around 1990 I stated seeing Dr. Wassner. It was kind of nice because The Hershey Med. Center was only about 15 miles from my house. I still went to the Dr. about every 3 months. I took the Growth Hormore until about age 17. It helped me to grow to about 5' 2". The medication (cystagon) worked very well until around 1998. Then my kidney started to fail. This is when I started on Dialysis in Oct. or Nov. 1998. I was on Dialysis until June 1999. I got 2 calls for Kidney's in June. The first one I did not call my Dr. back because I was pretty scared of the whole transplant thing. The second call came when I was in The Hospital on The Dialysis Machine. It was around 1pm on June 5 1999. My favorite dialysis nurse (Michelle), took me up to get ready for the transplant. Michelle is a great, caring person, and a beautiful young woman (age 27 or so at the time). I told the transplant doctor's at about 4pm that I wanted them to wait until about 7pm to do the transplant, so that I could see The Belmont Stakes. A very important horse race. I love horse racing. They just laughed as my parents did. So at about 6pm, off I went. Everything went well during the transplant. After the transplant I did not do very well. I was all stoped up. I could not go to the bathroom for 3 days. I could not urinate or do the other thing. It was hell. I was in a lot of pain. Finally after many procedures, I could go. These procedures were very painfulI. They try and help you go to the bathroom. I still was held in the hospital for about 8 days. After my transplsnt I took 2 months off of work. I needed that. Just to get back into the flow of things. After my transplant I started working out. You see, at one point before Dialysis I was 205lbs. Before that transplant I was about 180. I started working out at home, then went to a trainer to help me on the basics of lifting weights, and now I continue to work out 5 to 6 days a week. I got down to 132lbs in 2001. I did a lot of cardio to get down to that weight. When I got down to that weight then started to try and build more muscle. I am now about 145lbs. In June this year I competed in The U.S. Transplant Games in Orlando, Fl. I was on Team Philadelphia. Our team had 151 athletes. A total of 1500 athletes competed from 49 states and a few countries. I competed in The Softball Throw and Table Tennis. Unfortunately I did not do as good as I thought I would. I really did not practice that much. I learned a important lesson. Train for your events. If you want to see information of The U.S. Transplant Games and the World Games that are going to be held in Nancy, France July 19-28 2003 see the NKF.com or The Gift Of Life Website. I am planing on going to The World Games in France next Year. I would encourage everyone out there to tell people they know with transplants about the games. I am currently working for The State Government, where I have been working for about 6 years. I am going to be helping out several organizations in my area to get The Word Out About How Important Organ Donation is. One of the organizations is "The Gift Of Life Org." Growing up with Cystinosis was very hard and I still sometimes stuggle today. This disease stunts your growth. I was always the shortest person in my class. I was also over weight in my youth until I was about 17. Being a short kid was hard during my youth, but it was really hard when I was a teenager. This is the age where you start dating girls. Not many girls wanted to date a short fat kid. Also it was hard dealing with other young men (that whole man macho thing). This in-turn led to me being very shy. Fortunately I grew up with 3 great friends that lived in my neighborhood. They included me in everything they did. Eventually when I was in High School I started to date. Today I am looking for "Mrs. Right". I hope to find her soon, because I would like to get maried in my early 30"s. Today some of my hobbies include collecting baseball cards, watching all types of sports in person and on TV. My dad and I have gone to see 2 baseball games and we are going to see The Phillies on Sat. Aug. 3rd. I love sports. They are a big part of my life. Even though I was and still am short, I competed in several sports in my youth. I played baseball/tee-ball from age 6-15, 17. I played second base and pitched. I was on The All Star Team at age 12 in baseball. I also played soccer for a few years (about age 7-10). I played basketball from about ages 8-12. I wrestled in Middle School (age 12). I also enjoyed playing tennis, video games, and football with my friends. My parents. Words can not begin to tell everyone how great they are. But I will give you some thoughts that might help you understand what they mean to me. My parents always made sure that I took my Medication. Even though I did not like the taste, they convinced me to take it, because I had to take it to survive. They always told me that I could do anything, if I put my mind to it. I was kind of a spolled kid. I got a lot of things that I wanted. I am an only child, so they spent a lot of money on me. My Mom would wait in line for hours at Toy Stores to get "The New Just Released Star Wars Toys" and other toys. These toys where not cheap either. My Dad would always play baseball and other sports with me. He taught me how to play the game of baseball. He and my mother would go to all of my sporting events. All of them. They are and were so supportive. I hope to win a medal for them at The Transplant Games. These are only a few things that make my parents great. It would take me hours to explain. Well that is little bit about me and my life. If you want to know more, or if you just want to talk (especially parents of kids with cystinosis) just E-Mail me at Prelude195@aol.com. I have dealt with probably a lot of the same things that you and/or your young kids are dealing with. Please check out the pictures of me and my family. Below it explains what the pics are of. I have included 4 pictures in this profile. 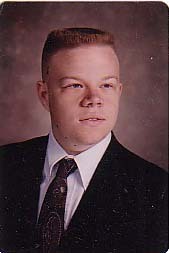 The small one with me in a suit, is my High School Senior Picture (1994). 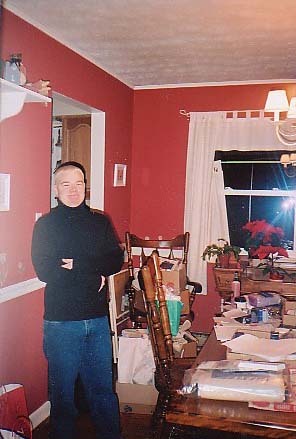 Another one has me in a black sweater and blue jeans (early 2002). 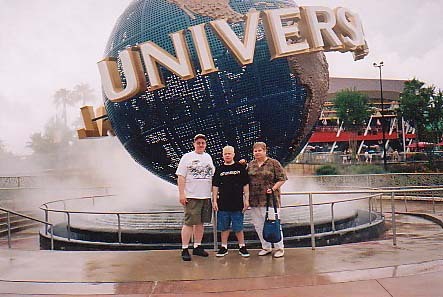 Then there is a picture with my parents and myself at Universal Studios (Orlando,Fl) in June 2002, during The U.S. Transplant Games. The last picture is me and my friend Dione's daughter, who had a liver trnsplant when she was very young. She is now 8. We are wearing are Team Philadelphia Shirts. 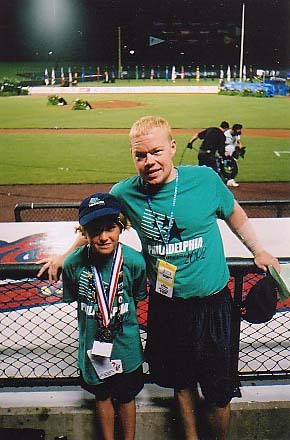 It was taken at The Closing Ceremonies in June for The 2002 U.S.Transplant Games, at Disney's Wide World Of Sports Complex. On Monday, April 28th, 2003, Barry spoke for almost an hour, and answered a number of questions of a class on Genetics at Penn State, you can read all about it and see the pictures by Clicking Here!